Recent research claims that if you take a 2:1 glucose-fructose mix, you increase the rate at which you can take up carbohydrates. Studies have shown that if two carbohydrates (Maltodextrin and Fructose) are blended in a 2:1 ratio, an athlete is capable of using 1.3 to 1.4 grams of carbohydrate per Kg of bodyweight per hour. This is about 40% higher than previous estimates of the amount of carbohydrate that could be taken on board when just maltodextrin was taken. This is especially important for cyclists doing long distance as it gives a greater ability to refuel, when the biggest challenge is taking on sufficient calories. Interestingly, maltodextrin has a GI index of 100. This means it directly provides glucose to the blood stream. Fructose (fruit sugars) work in a different way, giving a slower release of glucose to the energy. A fructose only energy drink would fail to give sufficient quick release of energy. However, when released together, they enable a parallel release of energy from different sources. I’ve tested on some longer rides, and doesn’t seem to do any harm in energy release. From anecdotal evidence of own rides, it is hard to test the claims of greater carbohydrate uptake because there are so many variables. – Even with optimal energy sources, you still feel tired after an 80 mile ride! But, I was impressed by studies to keep trying. You don’t necessarily have to buy pre-packaged 2:1 energy drinks. I’ve always felt that good cycle nutrition is to seek a certain balance of food stuffs. If you are doing a long cycle sportive, it would makes sense to mix glucose energy drinks with a few bananas. Relying on just one food source (say glucose) will give you energy, but mixing it up a little can give you a little extra. You could mix your own energy drinks adding fructose power or juice to a standard energy drink. However, I wouldn’t trust myself to get the right concentrations, it is easier just to buy these energy drinks. I wouldn’t necessarily use them on short distance rides, as a simple maltodextrin energy drink will provide sufficient energy. But, for anything from 50 miles up, it would be beneficial to gain at least some energy from this glucose / fructose combination as it helps optimize energy uptake, when it can be difficult to take enough on board. Torq 2:1 energy gels are based on this formula. They taste fine. Ingredients. Maltodextrin (43%), Water, Fructose (21%), Citric Acid, Electrolytes (Sodium Chloride, Potassium Chloride, Calcium Lactate, Magnesium Carbonate), Natural Yoghurt Flavour (0.2%), Natural Strawberry Flavour (0.05%), Preservative (Sodium Benzoate, Potassium Sorbate). 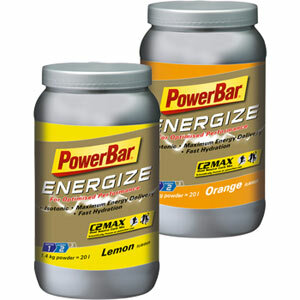 An energy bar and drink based on this 2:1 formula. Also with electrolytes, 3 popular flavours. I tried this and it sits on stomach reasonably well. Taste is fine, though can be hard to rate all the different energy bars by taste. You tend to become unfussy. Combining maltodextrin (glucose) with other energy sources seems to be one of the new trends in sport science. Last year I tried High 5′s 4:1 This mixed 4 parts maltodextrin with 1 part protein. Again studies claim that mixing carbohydrate with protein help give a more sustained and high level of energy during long distance ride. Wallis, G.A; Rowlands, D.S; Shaw, C; Jentjens, R.L; Jeukendrup, A.E (2005). Oxidation of Combined Ingestion of Maltodextrins and Fructose during Exercise. Medicine & Science in Sports & Exercise. 37(3): 426-432. 2. Roy L. P. G. Jentjens, Katie Underwood, Juul Achten, Kevin Currell, Christopher H. Mann, and Asker E. Jeukendrup (2006). Exogenous carbohydrate oxidation rates are elevated after combined ingestion of glucose and fructose during exercise in the heat. J Appl Physiol 100: 807-816. I believe that Lidle sell even cheaper cycling helmets, but I forget how much the one I have cost me, it was pretty cheap. It has the peak at the front to keep the sun out of your eyes, and is light and airy.